Out of all of the Food Network stars, Paula Deen is probably one of my favorites. She just seems like she would be a joy to be around. I would love to just spend a day sitting on a front porch with her, drinking ice tea, and talking about life. You just know that THAT would be a great day. While I love Paula Deen and have seen her show hundreds of times, I have never made anything from them. No particular reason why - I just never have. I happened to catch it the other day on a lazy Saturday when I was flipping through channels. 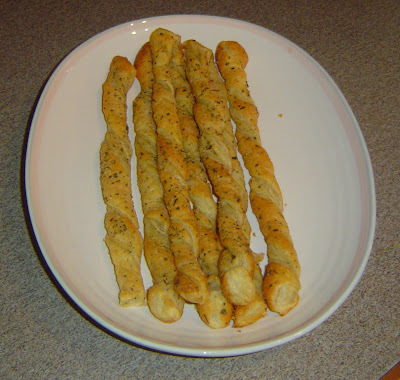 I think the show I caught was centered on soup and she happened to make some breadstick to accompany one of them. A week or two later I recreated them to go with a pasta dish I was making. You can find Paula’s recipe here and mine is below. 1- After your sheet of puff pastry is thawed, brush with melted butter. Flip and repeat. 2- In a shallow dish mix parmesan, garlic powder, oregano and black pepper. 3- Slice puff pastry in 1 inch slices. I think I got about 8 or 10 from mine. 4- Take one slice of puff pastry and dredge in mixture until well coated. Twist pastry lengthwise and place on a cookie sheet lined with parchment paper. Repeat until done. 5- Place into a 350 degree oven and bake until golden brown. Mine took about 15 – 18 minutes. Remove and serve. There are little variations between mine and Paula’s, but not many. This should show you how easy they are because when I did these I did them from memory but wanted to reference her recipe for you here. My thoughts on this dish: These came out really light, fluffy and with tons of flavor. I was able to taste each of the ingredients separately and they blended really well together. These also looked really impressive and kinda fancy. The boys (BD and HD) were also pretty impressed and loved them. I think you could also cut each strip in half before twisting and baking and they would probably be great for a party served with a side of alfredo or marinara!